At times, even experienced music engineers are skeptical, when they hear somebody laying claim to having the best studio monitors under $200. After all, the sound of music is so personal. Not everyone needs a Studio Monitor under $500 or going off the charts and would want to buy a KEF LS50, there are few music producers like your you and me, who are just starting and want to keep things under budget. To be honest, you aren’t compromising anything at all if you’re going with a studio monitor under $200. The studio monitors below are some of the models that I highly recommend you consider. All are under $200 but they all have their subtle differences. If you’re in the market for a new pair of studio monitors then take a look. These are studio quality monitors, designed to produce flat frequency sound; required by those that record and mix musical compositions. This pair of monitors, each independently powered and bi-amped, in other words two independent dedicated amplifiers. The tweeter is composed of a 1-inch silk dome with an improved flat frequency response due to the magnetic shielding. The woofer is Kevlar fiber and also has the magnetic shielding, as well as a high temperature voice coil for those who like to produce and mix their music for hours at a time. Each individual monitor can produce power up to 70 watts, 30 watts from the tweeter and 40 watts from the woofer. The dual amplifiers ensure that the power required is provided easily. Audio is therefore crisp, clean and without distortion, regardless of the level of volume. The high frequency bias can be switched using a 4-position selector that can be found on the back of each individual monitor. This allows the high frequency response to be adjusted according to the size of the room the speakers are operating in, as well as the shape of it and where they are placed within it. The input connections include an XLR connector, for use with balanced connections and a TRS connector, for TRS and TS connections that are both balanced and unbalanced. "Though not a looker, but the Monoprice Stage is a bliss for someone who wants to get started with a true, raw and loud Studio Monitor without any unnecessary bells and whistles." 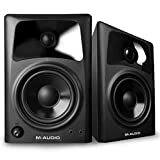 M-Audio studio monitors are relied on across the world by studio technicians and other professionals in the music business. This technology is now available in the home thanks to the M-Audio AV42, which as well as being great music monitors, also reproduce high quality sound for gaming and watching videos. The cabinets surrounding these monitors are custom tuned, the design of the speakers is fully optimized and they deliver fantastic sound, thanks to their advanced crossover technology. The woofer and tweeter cones are completely uncovered, without grills, to give a very precise sound. Its build quality is such that the cones are still tough enough to withstand any possible damage. However many users have complained that the M-Audio ﻿﻿AV42 are little poor on durability and hence being excellent speakers are placed on 4th position. Multiple devices can be connected to the monitors using the panel on the back of the left speaker. Only one connection is needed to send identically reproduced sound to both the active and passive speakers in the set up. RCA inputs ensure that the monitors are compatible with any gear you want to use with them. The headphone port in the front of the unit makes access easier, negating the need to move the monitor if it is in a fixed spot. 20 watts of power is provided per channel and an optimized two way bass design ensures bass is flawlessly extended; whilst the highs remain as clear as crystal. "If you’re looking for monitors that are on the lower end of the cost scale; then these may be the best studio monitors under $150 available on the market." These monitors are ideal for a wide range of needs and are compatible with any source you may require. Bluetooth ensures that they are easily connected to your laptop, tablet or your smartphone, reproducing audio that is both reliable and faultless. Samson MediaOne BT5 is also stylish to look at, using only the highest quality components in their manufacture. These monitors can turn out up to 40 watts at their peak and 20 watts per channel RMS. Though this figure might look low, however in practicality a 40W speaker too can be loud, very loud. The sound is produced at the high frequency by silk dome tweeter that is 1-inch in size. At the low frequency, 5-inch copolymer woofers produce the accuracy. Overall these monitors produce a sound that is natural, whilst filtering out any unwanted noise. As well as with Bluetooth capabilities, the monitors have RCA inputs, passive monitor terminals, headphone output and stereo input. There is also an LED indicator situated on the front panel along with a level control. These monitors are finished in a black, satin-look vinyl covering; and are rear vented with metal grills for the tweeters and woofers. These monitors can take your music experience to a different level, the music sounds crystal clear regardless of whether you are listening to a Spotify or iTunes playlist or a CD. It can all be controlled wirelessly via the Bluetooth connection. "Whether you want to track, edit or simply playback a project then this monitor can reproduce the sound flawlessly, and since it's great in design, will add some brownie points when your friends come over to see it." I personally love the JBL Control 1 because of its very compact design and ability to produce 150W of sound at any given time. Whether you are looking to get live feedback or you are after cheap studio monitors for mixing, JBL Control 1 monitor will be a great purchase for you. These monitors deliver sound that can fill a room and are compatible with a 25 to 200 watt amplifier. As I said above, they are also some of the smallest studio monitors you can buy at just 9” high, 6” wide and 5.5” in depth. However, the 2-way speaker design and the high quality cones that have been fitted in this model makes sure that not only does the sound fill a room, it stays accurate and realistic across the full range of frequencies. These monitors are suited for professional studios as well as home recordings. They use Titanium technology that not only makes them incredibly strong, it also makes them lightweight enough to transport easily and frequently. The Titanium technology also ensures high frequencies are reproduced in a crystal clear way, even if the volume is turned right up, the distortion is kept at bay. If you want the monitors to become a permanent feature; you’ll find that they can be placed in multiple places and at any angle thanks to the variable angle wall brackets that are provided in package. The Eris E4.5 from PreSonus is well renowned for a frequency response that is both accurate and smooth. If you really want to hear your mixes and tracks on every possible level; then these need to be a consideration. The 4.5-inch woofers are made of custom woven Kevlar, allowing the monitors to produce a clean sound; through a consistent dispersion pattern, across the whole range of frequencies. Every Eris monitor from PreSonus has a silk dome tweeter ensuring that the sound you hear is always refined and incredibly smooth. The sound’s wide dispersion pattern from tweeter is specifically designed to radiate, which ensures that the optimal listening area is significantly widened. This gives you an accurate reproduction of sound regardless of how much you choose to move around. Regardless of the music style you wish to play through these monitors, a top quality sound is guaranteed due to their customizable nature. The Acoustic Space switch has three settings, each of which helps to compensate the sound if the monitors need to be placed next to a wall, or even in a corner surrounded by two walls. Any other room anomalies can be cancelled out using the High and Mid controls. These monitors can be connected to a great number of sources, so whether you want to play through a media player, a mixer or an interface the set up is easy and the sound is flawless. It is even easy to connect these monitors directly to your smartphone, isn’t that awesome? Want to check your mix using headphones? No problem, the Eris 4.5 comes with a headphone amplifier. "If you are looking for cheap (priced) studio monitor that feel or sound incredible, these are definitely a great choice." This means the listening configuration for which the monitors are designed. If you have a home studio and would keep the speakers on the same desk as your computer monitor, then you would quite obviously need to choose a near-field option. Far-field designs let you listen to the sound accurately over a far greater distance, which is possible if you happen to have a dedicated and very large music studio. In most cases near-field speakers are going to be what you require, they allow you to monitor the sound much more accurately, without getting confused with other sounds that may be occurring in the room. This will be a particular consideration if you are going to be working in a larger room or studio. If you are working in a bedroom or a room the size of a home office then wattage of between 10 and 60 watts should be completely adequate. If the room you are going to be working in is to be much larger, then consider upping the power of your purchase. However you don’t need to go crazy over this, as the monitors listed below will suffice to any kind of room you have. THD is more or less an indicator of exactly how accurate the monitors are. How cleanly do the monitors reproduce the audio? In many cases ’N’ is added to the equation to signify ‘Noise’. THD + N means Total Harmonic Distortion plus noise. Audio circuits cause noise by their very definition but it’s important to consider how much. Even with cheap studio monitors you should always try to aim for the amount of distortion and noise to be as close to zero as possible. However most manufacturers tend to undermine this rating, hence make sure to take this number with a pinch of a salt. You need to ensure that the studio monitors that you select can handle the full range of frequency that you intend to throw at them. This is the only way you are going to get monitors that offer feedback as accurately as you need them to. The lowest frequency a monitor can handle is measured in hertz (Hz) and the highest is measured in kilohertz (kHz). You should look for a range of between 50 Hz and 20 kHz as this would suit most recording work that the monitors are needed for. As mentioned above, the frequency range should not be considered as critical as the monitor’s ability to reproduce sound with minimal distortion and background noise. This simply refers to the build quality of your monitors, what are they made from and are they built to last? Most monitors are made up of three separate parts, the cabinet, the circuitry and the drivers. Powered monitors also include an amplifier. All of the components are vital to the overall quality of the monitor and the accuracy of the feedback it is able to reproduce. If a model has a high quality driver, then it doesn’t mean anything if it is placed inside a poorly constructed cabinet.